Overview The nail-biting action continues continues when a Boeing 747 collides mid-air with a small private plane during a cross-country flight. Now without a captain and first officer, it's up to the senior flight attendant (Karen Black) to pilot the crippled plane to safety with the help of Alan Murdock (Charlton Heston) and Joe Patroni (George Kennedy). My thoughts Well, Airport 1975 is a movie of its time. Disaster movies were at its most popular, and the 1970 Airport had been a big hit, so the time was ripe for a sequel. So, pack an airplane full of semi celebrity actors, pack a script full of cliches, and go for it. It would be an exaggeration to say that Airport 1975 is a good movie. It's not. But it's not really a bad movie either. Technically it's very well executed. And it's a fun ride. But the script drags it down. The bit with the sick kid (Linda Blair) and the singing nun (Helen Reddy) is just too much. I saw this on opening night in Stockholm (Jan 13, 1975, if IMDb is to be trusted). It seemed pretty exciting at the time. Now, 39 years later, not quite so much. What impressed me most now is how they managed to shoot the opening sequence in Dulles Airport. They must have closed off half the airport. I'd like to see anyone getting permission to shoot a movie like that today. But of course with today's technology they wouldn't have to. No, Airport 1975 hasn't aged well. But it's still kind of fun to watch. Not a total loss. Recommended for disaster nerds. 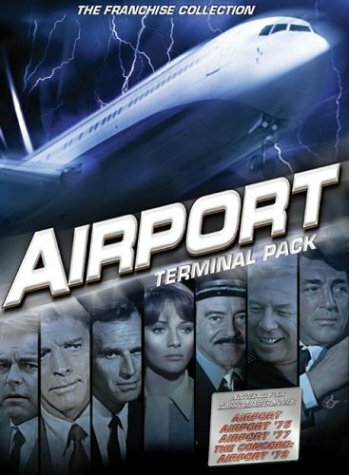 The only "Airport" movie that really clicked with me is Airplane I think I saw most of Airport films. I became a semi-fan of George Kennedy through these, he seemed to be in most of them? As a kid (young teenager) I loved seeing this kind of film on TV. But in the long run I seem to be most attached to The Poseidon Adventure (saw this first and probably the most) and I have never saw The Towering Inferno. If you liked "Airplane!" you might want to seek out the (completely serious) film that much of the dialog is based on, "Zero Hour". It's hard to watch it and keep a straight face if you're familiar with "Airplane!". And yes, George Kennedy plays Joe Patroni in all four Airport movies, although it's a very minor role in just "Airport 1975". Actually Mrs. Patroni and Joe, Jr are more in focus being passagers on the stricken 747. I must admit, I though Airplane was a parody on multiple movies, like the Airport ones, but from the trailer I've just seen it seems the plot follows Zero Hour very closely. I remember another pre-Airport film, maybe with Doug McClure? I don't think the one I remember is Zero Hour... The trailer said "deadly disease", is that referring to some kind of food poisoning? the movie I remember clearly had food poisoning in it. Now I am wondering if the one. I saw is Zero Hour after all I guess I will never know for sure. According to IMDb "Airplane!" was also inspired by a TV movie, "Flight into Danger" starring James Doohan. It features airline pilots being food poisoned and a passenger taking over. Could that be the movie you're thinking of, Achim? That is quite possible, actually... Thanks, again. Looking a little closer into Flight into Danger and Zero Hour I found that Arthur Hailey wrote the screenplay for Flight into Danger and later adapted it into the remake Zero Hour, so they should basically be the same story. And that's the same Arthur Hailey who later wrote Airport. So, there is a strong connection from Flight into Danger to Zero Hour to Airport to Airplane. 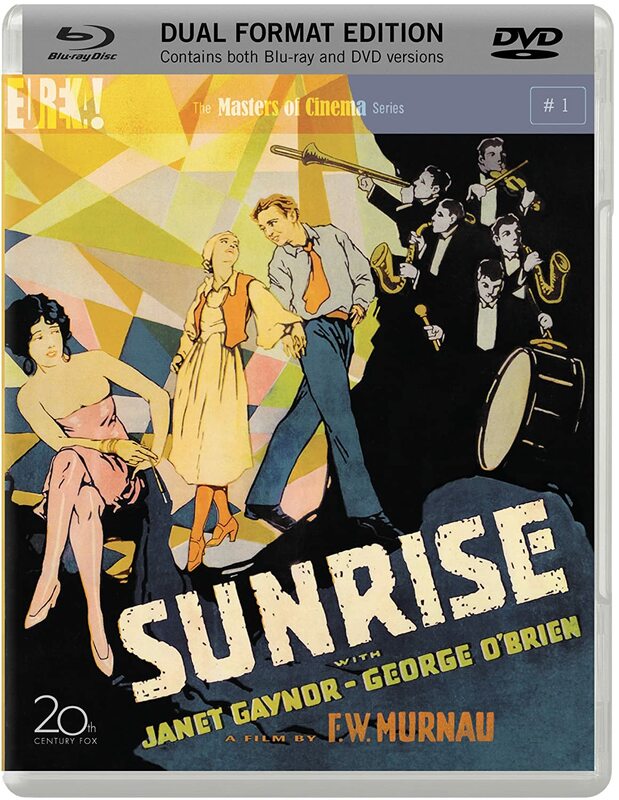 Overview This new edition of Sunrise (for the first time anywhere in the world on Blu-ray) contains two versions of the film: the previously released Movietone version and an alternate silent version of the film, recently discovered in the Czech Republic, of a higher visual quality than any other known source. The culmination of one of the greatest careers in film history, F. W. Murnau's Sunrise blends a story of fable-like simplicity with unparalled visual imagination and technical ingenuity. Invited to Hollywood by William Fox and given total artistic freedom on any project he wished, Murnau's tale of the idyllic marriage of a peasant couple (George O'Brien and Janet Gaynor) threatened by a vamp-like seductress from the city (Margaret Livingston) created a milestone of film expressionism. Made in the twilight of the silent era, Sunrise became both a swan song for a vanishing medium and one of the few films to instantly achieve legendary status. Winner of three Oscars® for Best Actress (Gaynor), Cinematography, and a never-repeated award for "Unique and Artistic Picture", its influence and stature has only grown with each passing year. The Masters of Cinema Series is proud to present Sunrise on Blu-ray and 2 x DVD. My thoughts I have stated before that I am not too big on silent movies, with the exception of slapstick like Buster Keaton, Harold Lloyd and Charlie Chaplin. So it was with som trepidation that I approached a classic like Sunrise. And I'm afraid that my instincts were right. The reason why I don't generally like silent movies isn't the fact that they are silent. It's about the acting style of the silent era. It seems to me that most silent actors are ”theater acting” rather than ”movie acting”. So what's the difference? Well, in the theater an actor can't be subtle. You have to project your emotions all the way to the back rows, and there are no closeups to do it. In essence, you must be overacting. That works well in the theater, but I find it quite disturbing to see it in movies. Sunrise is excellent in many ways. It's a beautiful story. The cinematography is pioneering in many ways. And Janet Gaynor is good. But the acting style just ruins the mood for me. I know many people rank this film extremely highly, and I won't say that they are wrong. It's just not a film that works well for me. Overview A teenage couple making out in the woods accidentally runs over an alien creature with their car. The creature's hand falls off, but it comes alive, and, with an eye growing out of it, begins to stalk the teens. Meanwhile, Joe the town drunk wants to store the body in his refrigerator, but some of the alien's buddies inject alcohol into his system, and Joe dies of an overdose. My thoughts The first time I saw this in the cinema back in the sixties I thought it was absolutely terrible. I have since come to re-evaluate it, and I find it mildly amusing. 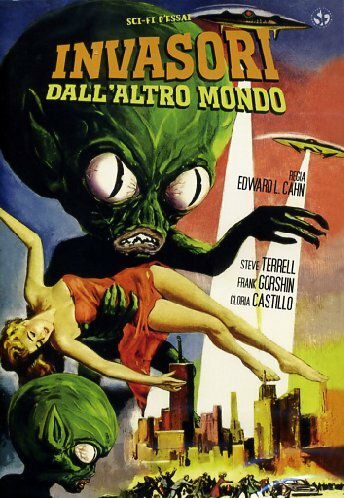 The design of the saucer men – one of Paul Blaisdell's better efforts – has become quite iconic. I think part of the reason I didn't like it initially was that I expected a serious science fiction (or even horror) story, since the Swedish title translates to “The Crawling Hand”. It's a silly little movie, and if you watch it with that in mind, it can be rather enjoyable. Unfortunately it's not easy to find, which is why I had to get this Italian release, and the quality is just slightly better than VHS. Overview Stanley Kramer followed his Oscar®-winning Judgment at Nuremberg with this sobering investigation of American greed. Ah, who are we kidding? It's a Mad, Mad, Mad, Mad World, about a group of strangers fighting tooth and nail over buried treasure, is the most grandly harebrained movie ever made, a pileup of slapstick and borscht-belt-y one-liners performed by a nonpareil cast, including Milton Berle, Sid Caesar, Ethel Merman, Mickey Rooney, Spencer Tracy, Jonathan Winters, and a boatload of other playing-to-the-rafters comedy legends. For sheer scale of silliness, Kramer's wildly uncharacteristic film is unlike any other, an exhilarating epic of tomfoolery. 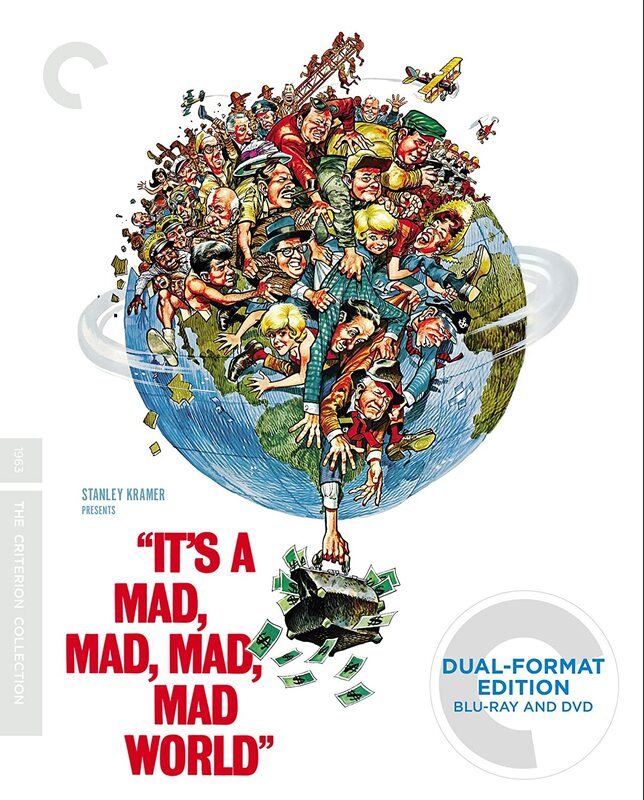 My thoughts Robert H. Harris has done a great job with the restoration of It's a Mad, Mad, Mad, Mad World. But if you're hoping to finally see it in its full length as it was initially shown in 1963 you're going to be disappointed. Before you watch the extended version you really should watch “Restoration Demonstration” on the same disc. That will tell you what to expect and why some of the reconstructed scenes look the way they do. For a few scenes only the sound has survived, and these scenes are accompanied by stills. Some scenes only existed as an Asian print with subtitles. If these things bother you, you may be better off watching the general release version of the movie. The general release version runs 163 minutes. The extended version is a little more than half an hour longer. But is it better? In my opinion, no. I have seen the general release version in the cinema and on DVD several times. Now watching the extended version there was really only one scene that I felt should have been kept in there. So, is Mad World the funniest comedy ever? No, not even close. There are few laugh-out-loud moments. But it's almost constantly amusing, and never boring – if you appreciate its kind of humor, which I understand not everyone does. Apart from two versions of the film, the Criterion Collection release also includes several really interesting featurettes. The one that I liked the most was the one about the film's visual and sound effects. The extended cut also has a commentary, but I haven't listened to that yet. This edition has an SRP of $49.95, but you can get it for $29.99 from Amazon. A bit on the expensive side, but you get 3 DVDs and 2 blu-ray discs. Personally I never hesitated. Funniest ever .. really depends on your sense of humor. Of course. Make no mistake about it, I love this movie. It's just that a lot of people seem to think it's the funniest movie ever, and I just don't agree. I would be more likely to nominate some old Buster Keaton movie, for example The General. Nostalgia ... yep I get it. We have lost most all the great houses in Portland (area). Big mega-plexes but .. really not the same. Overview Disney's triumphant musical production arrives on Blu-ray for the first time, featuring an incredible new digital restoration with enhanced picture and restored sound! The legendary Annette Funicello is at her best in this joyful adventure for the whole family. Experience a fantastic excursion into the world of Mother Goose where all roads lead to magical, merry Toyland. While Mary Contrary (Funicello) and Tom Piper prepare for their wedding, the villainous Barnaby schemes to steal Mary away, setting off a series of hilarious comic chases and double-crosses. Will the silly villain succeed, or will there be a happily ever after for Tom and Mary? Enjoy this delightful fantasy like never before on Blu-ray! My thoughts I had originally not planned on getting this title as it didn't really seem like it would be something that I would enjoy. I changed my mind when I learned that Zorro regulars Henry Calvin and Gene Sheldon were in it. I should have trusted my initial instinct. For a Disney musical, Babes in Toyland is unusually drab. The story is mediocre, the songs are uninspired. Annette Funicello is cute, but unexceptional, Tommy Sands comes off as a poor mans Frankie Avalon. Ray Bolger is ok as the villain, but is upstaged by his henchmen (Calvin and Sheldon). The best thing I can say about this blu-ray release is that the video quality is really good. This film might be fun for small kids. And possibly for grown-ups that saw this as a kid. For me it was mostly boring.